ANCHORAGE (Feb. 25, 2013) — Alaska Symphony of Seafood celebrates 20 th Anniversary and announces the winners of its annual New Products Contest judging event held in Seattle. The competition enlists chefs and industry experts to pick the best new seafood products each year. The winners were announced Saturday at the Gala Soiree in Anchorage, where contestants, industry representatives, media and attendees gathered to celebrate and toast the winners. This year’s first place winners included: Alaskan Sablefish Unagi Style by Triad Fisheries in the Foodservice category, Zesty Grill Sockeye Salmon by Copper River Seafoods in the Retail Category and AquaCuisine’s Lit’l Sammies in the Smoked category. 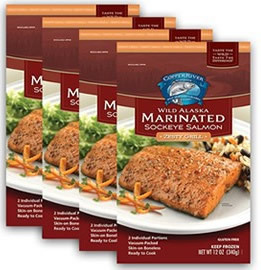 The grand prize, awarded to the product that received the most overall votes, also went to Zesty Grill Sockeye Salmon by Copper River Seafoods. The first place winners from each category, and the grand prize winner, will receive booth space at the distinguished International Boston Seafood Show in March, as well as airfare to and from the show. The Alaska Symphony of Seafood New Products Contest kicked off on February 13th in Seattle, where the judges tasted, deliberated and selected their favorite products. Evaluations were based on the products’ packaging and presentation, overall eating experience, price and potential for commercial success. This year’s judges included: Brian O’Connor from Skillet, Jason Wilson from Crush, cookbook author Tomi Marsh, restaurant consultant Jake Kosseff, Tony Catini from Serious Pie, Charles Benton from Sysco, Dezi Bonow from Palace Kitchen, Cynthia Nims from Mon Appetit and Molly Hancock from FareStart. Sponsors for this year’s event include: the Alaska Fisheries Development Foundation, Alaska Seafood Marketing Institute, At-sea Processors Association, Northwest Fisheries Association, Marel, Trident Seafoods, Copper River Seafoods, Alaska Air Cargo, Alaska Longline Company, Marine Stewardship Council, American Seafoods, City of Unalaska, APICDA, NSF Seafood, Alaska Commercial Fishing and Agriculture Bank, Alaskan Brewing Co., Port of Seattle, Kwik’Pak Fisheries, Bristol Bay Economic Development Corporation. Lynden, Pacific Seafood Processors Association, Alaska Marine Nutrition, Global Seas, United States Seafood, Signature Seafoods, North Pacific Seafoods, Young deNormandie, Pacific Seafoods, Coastal Transportation, Ken Simpson, Columbia Bank, Northern Air Cargo, Alaska Brands Group, Westmar Company, E & E Seafoods. The Gala Soiree concluded with the announcement of the Anchorage People’s Choice winner, Zesty Grill Sockeye Salmon by Copper River Seafoods, based on the attendees’ votes. For a complete list of this year’s winners go to: http://www.symphonyofseafood.com. Since 1993, the Alaska Symphony of Seafood has celebrated creative and innovative ideas in the seafood industry, bringing together a host of new products before a panel of judges and the public. It was created by the Alaska Fisheries Development Foundation to promote new product development for seafood harvested in Alaskan waters by encouraging participation and sponsorship from a wide variety of companies and organizations that together, are building the future of the Alaska fishing industry. For more information, visit www.symphonyofseafood.com.